The jailbreak trial of Mohamed Morsi has been postponed to 22 February as Egypt's ousted president made his second appearance in court since the army overthrew him on 3 July amid mass protests against his rule. The first session was held at the Police Academy in Cairo on Tuesday. Morsi, along with other 21 Islamist defendants, spent the session in a sound-proof glass cage that was set up to prevent a repeat of the interruptions they made in their first court appearance last year. The rest of the defendants, including some 70 Palestinians, are on the run and being tried in absentia. The ousted president told the court he had been flown to the trial location at 7pm the previous night and insisted he is a political prisoner, not a detainee. "I am the legitimate president of the country," he told the court "and this trial is not legal." The detainees chanted "Down with military rule." But in a surprise move, he appointed Islamist thinker Mohamed Selim El Awa as his defence lawyer, who shall represent him in this trial and all three other cases Morsi faces. In a separate trial for inciting violence, Morsi repeatedly refused to appoint a lawyer, saying he did not recognise the court's authority. El Awa, a candidate in 2012 presidential election, defended several Muslim Brotherhood members during the reign of longtime autocrat Hosni Mubarak. But he has denied being officially affiliated to the group. He was also legal advisor to the moderate-Islamist Wasat Party, a close ally of the Brotherhood. The session was not broadcast live despite an earlier announcement that it would be aired on state-run television. It was broadcast few hours later. The date of the trial marks the third anniversary of the prison break that took place during the 18-day uprising against veteran strongman Mubarak in 2011. TV footage showed Morsi in white prison garb, nervously pacing back and forth in a cage in the courthouse, alongside other Islamist defendants who shouted "null, null" at the judges, whose legitimacy they refuse to acknowledge. 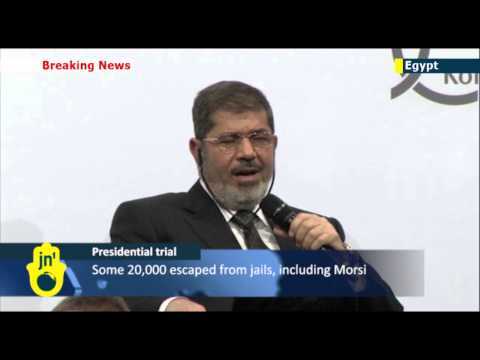 Morsi also shouted at the judge, telling him: "who are you?" The judge simply said "I'm the head of the Criminal Court" in response. The charges are linked to the escape of more than 20,000 inmates from three Egyptian prisons during the early days of the 2011 popular revolt. Prosecutors said defendants face charges of damaging and setting fire to prison buildings, murder, and attempting to murder several people and looting prison weapons depots while allowing prisoners from the "Hamas movement, Lebanon's Hezbollah, Jihadists, Brotherhood [members] and other criminals" to break out of jails. Morsi and 130 co-defendants are accused of "carrying out a plot to bring down the Egyptian state and its institutions." Prosecutors said over 800 fighters from Gaza had infiltrated Egypt, using RPGs and heavy armaments while storming three prisons, abducting four policemen and killing several other policemen and inmates. The deposed president was flown by helicopter from his prison near the Mediterranean city of Alexandria to the court in eastern Cairo. Other co-defendants were transferred in armoured vehicles from Tora prison on the outskirts of Cairo. Supporters of army chief Abdel Fattah El Sisi attempted to prevent Mohamed Abdel-Fattah and other defence lawyers from entering the premises and verbally abused them, according to Ahram Online's reporter at the scene. They held aloft pictures of El-Sisi, who is tipped to become Egypt's next president after growing immensely popular since the army's overthrow of Morsi. The Police Academy was heavily secured but Morsi supporters have not appeared in the vicinity of the court, according to Al-Ahram Arabic news website. The pro-Morsi protesters demonstrated in downtown Cairo instead, clashing with police forces who fired tear gas to disperse them. The defendants include senior Brotherhood leaders Mohamed Saad El-Katatni, Essam El-Erian, Mohamed El-Beltagy, and pro-Brotherhood preacher Safwat Hegazy. Morsi also faces three other separate trials for the killing of protesters and colluding with Hamas and Hezbollah to carry out a terrorist campaign in Egypt. Tuesday's trial marks Morsi's second court appearance since his ouster by the military on 3 July amid massive protests against his turbulent year-long rule. His first public forum since his removal was in November in a trial over inciting violence relating to the deaths of opposition protesters while in office. State television only aired brief footage of Morsi in which he repeatedly shouted "I am the legitimate president." He missed another trial session on 8 January after bad weather prevented a helicopter bringing him to court, security officials said. Morsi trial postponed due to "bad weather"